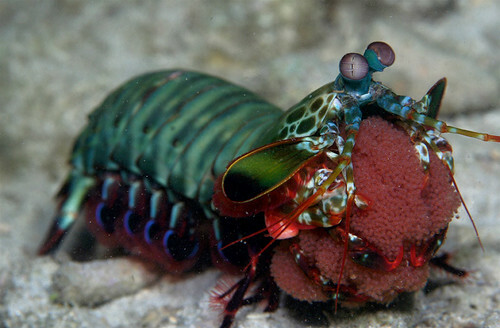 Mantis shrimp are among my favorite animals, and for good reason. Otherwise known as stomatopods, they diverged from other crustaceans over 400 million years ago during the Cambrian period, so they are only distantly related to the likes of shrimp and lobsters. Many are very brightly colored, like the one above. Some are also fluorescent. Eyesight – Mantis shrimp have the most complex eyes of all animals. Each eye is on a stalk and can move independently of the other. They are each separated into three bands (trinocular vision), allowing each eye to see objects from three different perspectives, giving both of them highly-developed depth perception. They can detect wavelengths from the infra-red to the ultraviolet; in all they can see ten times more colors than humans. Moreover, they are the only animals that can detect circular polarized light (CPL). Before it was discovered that mantis shrimp could see CPL, there were only three known modes of sight – black and white, color, and linearly polarized vision. So mantis shrimp occupy a quarter of the known ways of perceiving light alone. Mantis shrimp eyes have special filters that convert CPL into linear polarized light. To humans, linear polarized light appears as glare; but for mantis shrimp, the polarized light is used in mating displays. So the ability to detect CPL probably arose from sexual selection. One theory speculates that the CPL displays allow mantis shrimp to communicate and perform mating rituals without attracting the attention of predators, which can’t see the CPL they reflect. For more information on circular polarized light, see this Wired article or this Science Daily article. 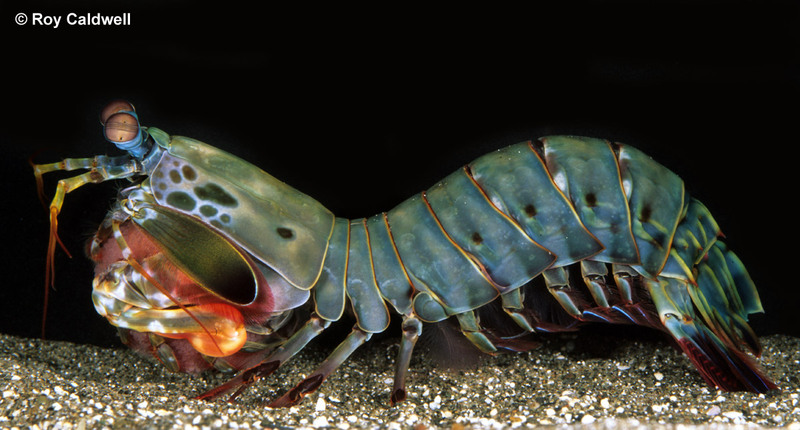 Claws – Mantis shrimp are renowned for being amazingly violent (they are sometimes called “thumb splitters”). They have been known to break glass aquarium walls with their strikes, which are among the fastest in the animal kingdom and have the power of a .22 caliber bullet. Their claws look very much like preying mantis claws (hence the name “mantis” shrimp). According to Wikipedia, mantis shrimp can be categorized by the type of claw they have – spearers and smashers. Spearers, like the one below, have toothed claws that they use to impale prey. Clubbers have knobby claws that they use to bash prey. This mantis shrimp, Odontodactylus scyllarus, has clubs. Stomatopod anatomy - mantis shrimp have a typical decapod body plan, like that of crabs, lobsters, and shrimp. This mantis shrimp, Lysiosquillina glabriuscula, was photographed in blue light with a yellow filter to show only the fluorescence. 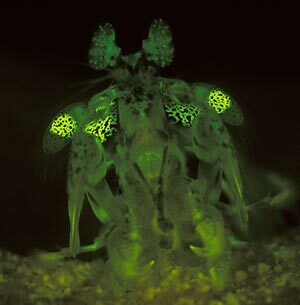 Scientists believe that mantis shrimp use the fluorescence to communicate with each other. Butcher’s Broom – Flowers That Grow on Leaves? Araucariaceae – Monkey Puzzles, Bunya-Bunyas, Wollemi Pines, and More!